After a break for the holidays it’s time once again for the Crime Fiction Alphabet meme hosted by Kerrie at Mysteries in Paradise. There’s still half an alphabet to go so join in if you’d like. Perhaps because we’ve been in a nasty heat wave and I am disgruntled today so I’m going to talk about a book that I didn’t like. In fact it’s the book that stopped me reading Robin Cook all together. 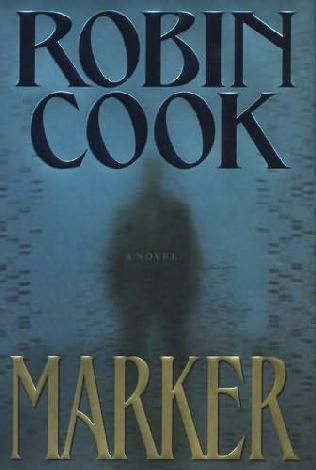 Robin Cook’s Marker is the fifth book in a series featuring New York City medical examiners Jack Stapleton and Laurie Montgomery. In this outing Montgomery becomes troubled when she autopsies two bodies in a row of otherwise healthy young people who have had heart attacks after routine surgery. She becomes convinced that there is something untoward about the deaths and goes traipsing about New York hospitals sticking her nose into things she shouldn’t and, eventually, uncovering a monstrous scheme (the book’s title should tell you something about that). As far as medical thrillers go that sounds like a perfectly acceptable plot and it would be except I haven’t mentioned the unending, yawn-inducing diatribe on the evils of the American health system (in particular HMOs) that pervades the very (very) long book. Maker is all about the message. Presumably Cook thinks his readers are complete dolts because he repeats the message a dozen or more times during the narrative and then, in case you’re particularly stupid, explains what it was he was saying during a long afterword (should you want to avoid reading it I’ll summarise: doctors are good, everyone else is evil, HMOs actively recruit known serial killers). As if taking over my fiction for his unsolicited political rant wasn’t bad enough Cook must have been so busy sticking pins in his voodoo doll of a HMO owner that he forgot to include things like credible characters and some suspense. Laurie behaves incredibly stupidly throughout this book and the on/off relationship between her and Jack suffers yet another hurdle that is the same as the hurdles they faced in the previous four books. also, the ending is sign-posted in large neon lights at about page 35 which makes the remaining 503 pages a complete snooze. Before publishing Marker in 2005 Cook had released 20 standalone novels as well as the previous four in the series featuring Jack and Laurie (I’ve read all but a couple of the two dozen books). In the earlier works there is a nice balance between science, suspense and social commentary but over time the politics takes on a bigger and bigger role until, by the time we get to Marker, it’s all-pervasive. As I have mentioned before I hate being lectured at in my fiction. My problem is not that I disagree entirely with Cook’s views (though he fails quite spectacularly to acknowledge that many besides the HMOs, including the powerful lobby groups formed by doctors in the guise of professional associations who make sure that only limited numbers of wealthy people can ever join their ranks, should be shouldering their share of the blame for the mess that is modern health care). My problem is that this is supposed to be fiction and if a novelist wants to send me a message then they should do so via their characters and an engaging story. If I want a rant of any political persuasion I’ll watch cable TV news thanks very much. I do wonder if, once they’ve made a name for themselves or reached a guaranteed level of sales per book, some authors can publish anything they like. Does anyone who matters actually read new manuscripts from Cook (and others like him) or do they automatically go straight to the printing and marketing stage? Or is it that no one is prepared to tell such A-list authors what they really think of a new manuscript for fear they’ll move to another agent/publisher? Or is it that I’m in the minority of people who don’t fancy being spoon-fed one-sided politics disguised as informed opinion in my entertainment? Whatever the answer to those questions, don’t read Robin Cook’s Marker. It’s awful. This entry was posted in Crime Fiction Alphabet, memes and challenges, rant or rave, Robin Cook, USA. Bookmark the permalink. Thanks for this contribution Bernadette. You’ve managed to stick to your single word title “challenge”. I used to read a lot of Robin Cook titles but somehow grew out of them. I’ve never read anything from this series though. Bernadette I don’t mind a political message in a book, but when it is repeated over and over just in case you did not understand it the first ten times it was mentioned, I go mad. I do think that agents, publishers, and editors [do they still exist?] are afraid to tell an A- list author they are on the wrong track. I used to dash down and buy every Patricia Cornwell in hardback, but the last time I read her in PB she was still in the slump that began when she forgot that plots are important. Or is it that no one is prepared to tell such A-list authors what they really think of a new manuscript for fear they’ll move to another agent/publisher? Yes, it must be that. Patricia Cornwell, as Norman says, and Elizabeth George, to come up with another example. I too don’t know what happened to Robin Cook. His first novel, Coma, was genre-breaking, and his next few were good (for their type). Then, he just went into c*** mode. What a disappointment. Jonathan Kellerman is another author who ruined a perfectly good series via blandness, smugness and formula. For medical thrillers, I rather like Michael Palmer, but to be honest it seems to me that, so far as medical crime is concerned, there are only one or two standard plots that everyone recycles in an unimaginative way. Which is why I rarely finish them if I pick one up these days. Incidentally, people must still buy P Cornwell, J Patterson etc in droves as they consistently top the best seller charts. Why oh why, when they are indescribably awful, despite a first few good titles in each case, and despite so many better novels being published all the time? Bernadette – I think Dorte really has a point. Once an author has “hit the big time,” it may simply be that no-one pays attention to the quality of the work, since the sales are there. I used to read Robin Cook religiously and thoroughly enjoy his work. I agree with all of you, though, that in the last several novels, a tight, plausible plot and interesting characters in believable situations has given way to the “soabox.” Shame, too, in my opinion. I’ve never read Robin Cook, as I’ve never been drawn to medical suspenses. I did read a lot of Patricia Cornwall at one point, but she just got too violent and way too introspective for me. There are some mystery authors I enjoy even though their plots seem to grow more bland and formulaic with time, but I think it’s because I’ve gotten to know the characters so well. Long time I a read a Robin Cook novel. Last one I read was Brain Dead, I think! Here is my Crime Fiction Alphabet: M post!